Lake Nona also known as Medical City is a newer residential community in the southeast region of Orlando. Lake Nona is made up of several different housing developments centered on Medical City, a collection of innovative hospitals and medical research facilities. The actual Medical City center of Lake Nona is 650 acres of cutting edge medical and life sciences facilities. This is where you can find the best in medical care, research and education in Florida. Medical City has been expertly and carefully planned with the idea that all of these medical facilities in close proximity to one another will accelerate innovation in medicine benefitting the patient. With these state of these state of the art medical facilities networking and collaborating together in one area it has put Orlando on the map as a world class destination for health care, jobs, and education. In medical city you will find the University of Florida Health Sciences Campus, Sanford-Burnham Medical Research Institute, VA Medical Center, Nemours Children’s Hospital, and University of Florida Academic and Research Center. 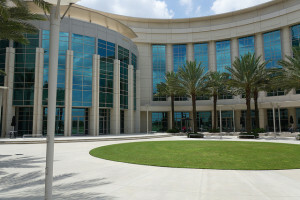 The collaborative environment of Medical City transfers into the K-12 education system of Lake Nona. Lake Nona refers to this concept as the CLE (Collaborative Learning Environment). Put together by over 70 education professionals known as the Lake Nona Education Initiative the CLE was put together with the goal of schools and residents interacting in real time the medical and research facilities as well as businesses of Lake Nona and even classrooms and other learning entities around the world through the use of cutting edge technology like the interactive white board. In addition to the best in medical facilities and schools Lake Nona has over 5 million square feet of commercial space in four different areas around the community. These areas are currently and will in the future hold retail stores, medical offices, grocery stores, businesses, restaurants and more in Lake Nona Plaza, Lake Nona Village, Lake Nona Town Center, and Office Space in a business park. With all of the modern amenities Lake Nona still retains a picturesque and lush natural atmosphere full of parks, ponds, lakes, and natural vegetation that make for a wonderful and serene place to live. Lake Nona has a home for every lifestyle from condos over commercial space to large quiet sprawling lake front golf course estates. Laureate Park features single family homes with modern architecture and forward thinking intelligent components. Village Walk brings a new way of water front resort style living to central Florida with canal front homes and a walking path directly to Lake Nona Village. Water’s Edge offers the best in Lake Nona lake front living with townhomes and single family homes with lake front park and boat storage. Northlake Park is 500 acres of neo-traditional living with a YMCA that houses a modern elementary school. Lake Nona Golf and Country Club has been the original standing grand gated golf community in the area full of grand golf estates and some of the best the Country Club living has to offer on a PGA golf course. Water Mark Apartments have been built with college students and medical professionals in mind offering the best in luxury apartments just steps from Medical City. Looking for a home in Lake Nona? The Orlando Buyers Agent team is ready to offer you our unique full range of services to help you purchase your dream Orlando home. Looking for new construction homes in Lake Nona? Benefit from the buyer’s only real estate services of Orlando Buyers Agent and save thousands. Let’s get started finding that perfect Lake Nona home!